Runtime 2 hr. 3 min. SynopsisIn Sicario: Day of the Soldado, the series begins a new chapter. 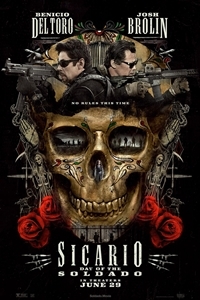 In the drug war, there are no rules - and as the cartels have begun trafficking terrorists across the US border, federal agent Matt Graver (Josh Brolin) calls on the mysterious Alejandro (Benicio Del Toro), whose family was murdered by a cartel kingpin, to escalate the war in nefarious ways. Alejandro kidnaps the kingpin's daughter to inflame the conflict - but when the girl is seen as collateral damage, her fate will come between the two men as they question everything they are fighting for.